I am very thankful to Geoconferences for awarding me the JH Lord Travel Grant to help me attending the AAPG Annual Convention & Exhibition (2-5 April 2017) in Houston (Texas, USA). This conference was organized by the American Association of Petroleum Geologists (AAPG) in conjunction with the Society for Sedimentary Geology (SEPM). It represents one of the major international scientific event for the geosciences community. During this conference, I had the opportunity to present a talk and a poster related to my PhD project. The talk was entitled “Stratigraphic Evolution of the Barrow Group (Northern Carnarvon Basin, North West Shelf, Australia): Controls on the Architecture of a Shelf-Margin during a Syn-Rift to Post-Rift Transition” and was given in the theme “SEPM Research Symposium: How Seismic and Sequence Stratigraphy Have Advanced: 40 Years After AAPG Memoir 26 and 30 Years After SEPM Special Publication 42”, chaired by K. Ehman and H. Posamentier. In the same session, I was associated with two other talks entitled “Deep-Water Turbidites in Not-so-Deep Basins” and “Combining Full-Volume 3D Seismic Interpretation with Quantitative Seismic Geomorphology and Modern Process-Based Analogue Databases: The Next Generation Tools for Stratigraphic Analysis and Reservoir Characterization”, given by Henry Posamentier and Julien Bourget, respectively. 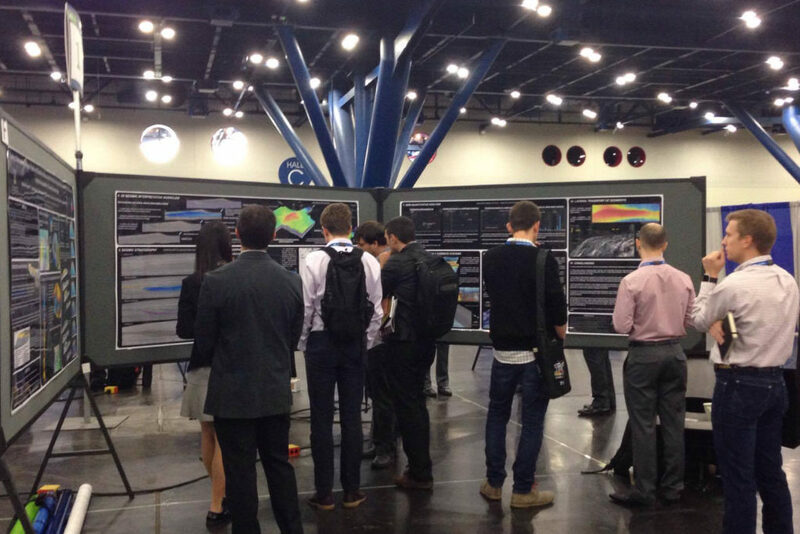 The title of the poster was “Linking Shallow-Marine Process Regime and Slope/Basin Architecture Within the Barrow Group (Northern Carnarvon Basin, Australia): Insights From Quantitative 3D Seismic Geomorphology” and was presented during the AAPG Student Poster session. This poster was part of the top 15 student poster recognized by the AAPG during this conference. Attending this conference was a unique opportunity for me to present advanced results on my PhD and to receive feedbacks from people working in the same discipline. Comments were positive and encouraging with key points to help me pursuing my work. Exchanging with these researchers was really beneficial for the future of my research. Also, this conference was proposing a very complete program and I attended other talks in various domains to enrich my knowledge and develop further some of my ideas. This event was also a great occasion to network with people from the industry and meet other postgraduate students working in similar areas.